“Creamy Coconut Coffee Chocolate Chunk Ice-Cream tastes so good. This no-churn healthy, vegan and gluten free and amazingly delicious Creamy Coconut Coffee Chocolate Chunk Ice-Cream can be made with just 5 simple ingredients. Oh my world! We do have a new favorite sweet treat at our home these days. Alright, let’s start. It’s perfect for summer. It’s super rich, creamy and cold. And obviously its sweet, as I said earlier! It’s everyone’s favorite, and super fun to eat. And it’s super duper DELISH. Kids and adults just love it. Wow, that must be something very special. As of now you might have already guessed it! 🙂 Yes, you might have guessed it right — it’s our dearie ‘ICE-CREAM’. But what is new in knowing that Ice Cream is everyone’s favourite? Yes, nothing new in that. But there’s definitely something very special and new in this Ice Cream. The new thing is our favorite ice-cream is guilt-free, gluten-free, dairy-free and vegan! 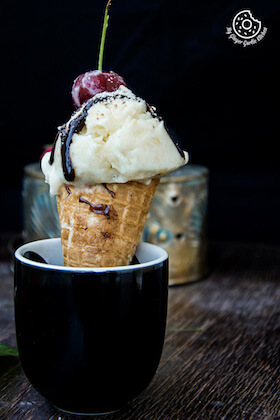 Here I present to you, the ‘5-Ingredient Creamy Coconut Coffee Chocolate Chunk Ice Cream’. And this delight can be whipped up without an ice cream maker. There are tons of reasons to make it. If you love coconut, you need to make it. If you love chocolate, you need to make it. If you love coffee, you need to make it. It you are gluten-free, you need to make it. If you are VEGAN, you need to make it. It you are health conscious, you need to make it. Seriously guys, it has so many PLUSES that you will surely want to make this. This one is possibly my very favorite flavor. It’s just so intense and delicious. I love the combo of chocolate and coffee. Could you tell me what would happen if you put them together in a creamy and sweet ice cream? You will fall in love! The best things about this Creamy Coconut Coffee Chocolate Chunk Ice-Cream is — it is so simple, quick and easy to make. And as stated earlier, you don’t need an ice cream maker to make this. SO anyone can make this, anytime! At this point, there are some questions you might ask! Does it contain my favorite coffee? Does it contain my favorite dark chocolate? So many YESs! Yeahhhh! It has everything I need to make my summer day special! So cheers to that. Hip, hip hooray!! Currently I am all over this coconut ice cream mania! And you all will soon going to see my other Vegan coconut ice-cream recipe. I hope you wouldn’t mind if I share that very soon! 😉 After all it’s summer. An ice-cream full of homemade flavors. YUMMM! What could be better than this? Right? Isn’t it kind of cool that you can make ice cream with just coconut milk and make your own dairy free sweetened condensed milk. Isn’t that awesome? I swear, making condensed milk is probably one of my favorites. And why do we need condensed milk? It prevents ice cream from crystallizing. So this is a must, and so much fun and darn easy to make! It has a mild flavor of coconut, but if you want a stronger coconut flavor, add some coconut extract. It’s incredibly creamy, rich and perfectly sweet. Added with a nice zing of coffee, and a decent crunch from chocolate! YUMMY! Ahaa, another plus, it has no eggs. Making this ice-cream is fuss free, without the need of an Ice Cream maker. I would like say that this is a creamy, dreamy and amazing coffee chocolate coconut ice cream, which also happens to be completely vegan. Currently, I am sure not an ice-cream-aholic anymore. Earlier, I simply loved ice-cream, and wanted to eat all the time. When I was ice-cream-aholic, I could eat ice-cream for breakfast, lunch, brunch, dinner! 😉 Ice cream was my utter weakness. I was sort of an ice cream fanatic. But there is some good news — that phase has gone now! 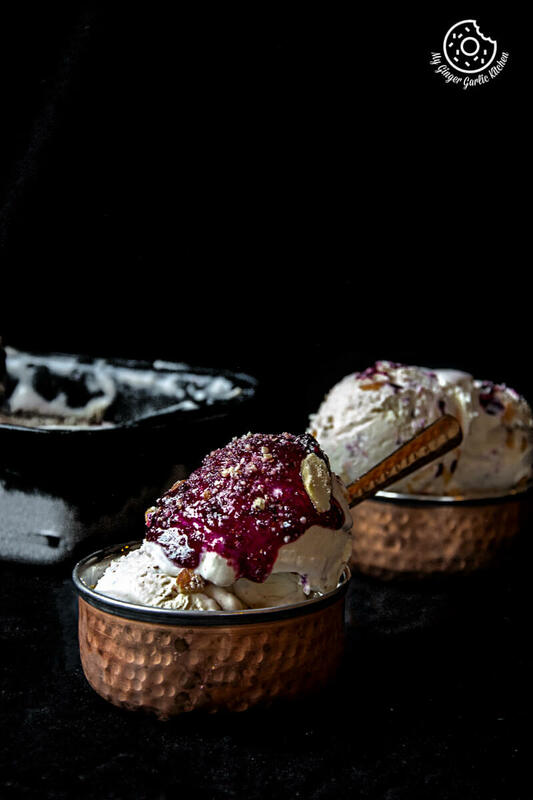 Let’s come out of drooling phase, and talk about how to make this creamy dreamy ice-cream. We all want creamy ice-cream, and for that we need full fat coconut milk. This will ensure a creamier ice cream. And we don’t have to worry about full fat, as coconuts are full of good fats. If you are a serious coffee lover like me then you will appreciate the intense flavour of coffee in this ice-cream. I have combined my favorite beverage in the whole wide world (coffee drink) with chunks of dark chocolate in a simple ice cream base. I then waited patiently for it to freeze. A gluten free summer treat means plenty of gluten free ice cream. 🙂 What do you say? 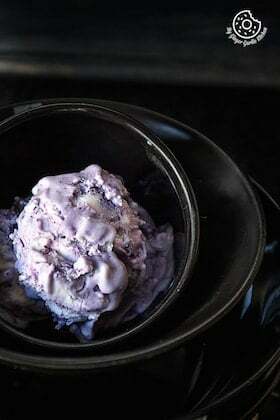 I love to make my own ice cream at home. The base of this ice-cream is full-fat coconut milk. Honestly, I just love coconut in everything! And this was also a big motivation for sharing coconut ice-cream with you. Gluten Free Dairy Free Ice Cream with no machine! Plus, you do not have to mix it every 30 minutes. For me, doing so is not really fun! ;-). And still the result is smooth, rich, creamy and scoopable! Amazingly delicious Creamy Coconut Coffee Chocolate Chunk Ice-Cream, with just 5 simple ingredients. This recipe is so damn easy, and there is no excuse for you to not try it. Believe me, you will simply adore it. Heat a saucepan. Add 200ml coconut milk, sugar and bring to boil and turn the heat on medium low heat. Stir well and gently simmer for 30 minutes, or until the milk is thick and has reduced by half. At this time milk will turn to a light golden color. Remove from heat and let cool completely. Freeze for 6 hours. Remove water from chilled coconut milk (400 ml) and carefully scoop the cream into a mixing bowl. Using an electric beater, whip up the coconut cream on high speed until it’s light and fluffy, 4-s minutes. Add the condensed coconut milk and whip on high speed for another 3-4 minutes. Add vanilla extract and fold gently. Add coffee, chocolate chunks and fold gently.Transfer to a an airtight container and top with shredded coconut and chocolate chunks. Freeze for 6 hours or overnight. Keep ice-cream at room temperature for 3-4 minutes, to make it easier to scoop. Heat a saucepan. Add 200ml coconut milk, sugar and bring to boil and turn the heat on medium low heat. Stir well and gently simmer for 30 minutes, or until the milk is thick and has reduced by half. At this time milk will turn to a light golden color. Remove from heat and let cool completely. Refrigerate for 4 hours or overnight. Using an electric beater, whip up the coconut cream on high speed until it's light and fluffy, 4-s minutes. Add vanilla extract and fold gently. Add coffee, chocolate chunks and fold gently. Transfer to a an airtight container and top with shredded coconut and chocolate chunks. Keep ice-cream at room temperature for 3-4 minutes, to make it easier to scoop.